As Menaggio has been introduced to you from the lake, it is appropriate to say something about the truly beautiful & well maintained fleet of boats operated by the Gestone Navigazione Laghi. Tirelessly criss-crossing passengers & vehicles on Lake Como from 5:50 until after 23:00 during the summer months, this fleet of car-ferrys, rapidos, and the rest, still fascinate the locals who turn out around the docks at their arrival, just to watch. I will begin this little summary with the Orione – I believe this to be the newest boat on the lake (around 2008) & it is also one of the largest ones, with a capacity of 700. 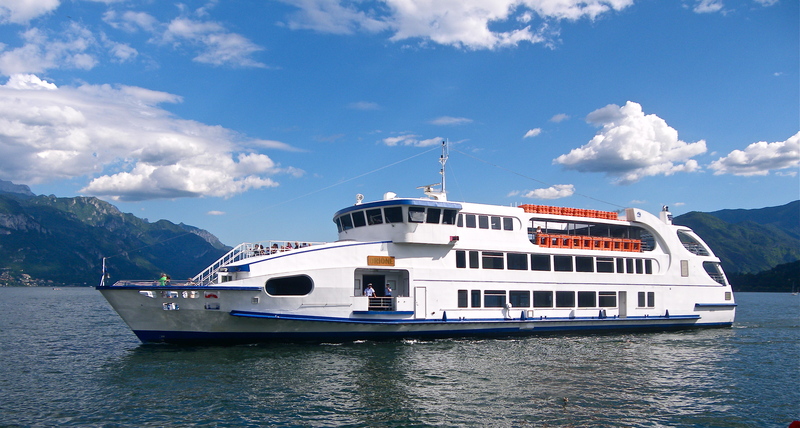 It is probably the tallest boat with 3 decks which allow for excellent viewing and great photo taking with it’s high elevation and easy access (3 staircases & an elevator) to all front and back decks. It has a restaurant (kitchen & bar) that can seat over 240, some over-stuffed leather chairs (a geniune luxury ride), lots of large windows and air-conditioning. Take a look at the magnificent Orione with a couple of the crew. ~ by mylakecomo on August 30, 2013. That looks like a fun boat!